Lateral epicondylitis, or "tennis elbow"
Lateral epicondylitis, or tennis elbow, can happen to anyone not just tennis players. Many types of repetitive activities can lead to tennis elbow, such as carrying shopping or suitcases, decorating, gardening or DIY. This guide will help you understand. 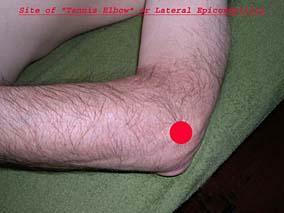 Tennis elbow causes pain that starts on the lateral epicondyle or outside part of the elbow. The forearm muscles that bend the hand backwards attach on the outside of the elbow and are connected by a single sinew or tendon. Tendons connect muscles to bone and are made up of strands of tough fibrous material. When muscles tighten, they pull on the tendons which in turn pulls on the bone, causing the bone to move. Tennis elbow is thought to be caused by small tears developing in the tendon which doesn't properly heal but gradually becomes weakened forming scar tissue and a thickening of the tendon. The main symptom of tennis elbow is pain that starts at the outer part of the elbow and may run down the forearm. The area may be tender to the touch. Gripping things may make the pain worse. A simple test for tennis elbow is to place your hand and forearm flat on a table, palm downwards, and get someone to hold the back of your fingers down. Then try and lift your fingers back off the table whilst the other person holds them down. This often leads to pain in the outer part of the elbow! Your Osteopath will first take a detailed medical history. You will need to answer questions about your injury, when your pain affects you, when it started etc. After your Osteopath has examined you he should advise if he can help you or not. Further tests, x-ray, ultrasound scanning or MRI scan are rarely needed. Your Osteopath may ask you to apply ice and/or heat to reduce any inflammation, ease pain and improve healing of the tendon. I have found that Laser therapy is particularly helpful for this type of problem. Exercises will be used to gradually stretch and strengthen the forearm muscles. Your Osteopath will try to identify the reason for your injury and will try to advise on future prevention. Occasionally a strap or "Tennis Elbow Brace" may be advised. It can take up to 3 months to help a tennis elbow depending on how Chronic and how long you have had the problem, but most of the treatment and management is done by the patient! The sooner you consult your Osteopath, the quicker you will be better!